Horse barns are notoriously dusty. Dust particles abound in the bedding your horse sleeps in, in the hay and feed he consumes, and commonly in the dirt aisles or stall floors themselves. As a horse owner, you mist take measures to reduce and control dust in your barn. 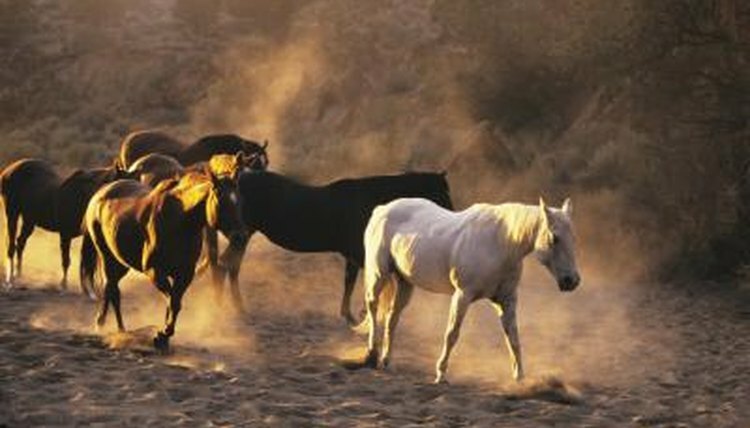 Your horses can suffer from health problems as a result of living in an environment that's too dusty. Mild allergies are common when your barn, arena or entire facility is suffering from a dust overload. Do not be surprised if your horse has irritated, red, runny eyes, and a runny nose to match, when he has been breathing and eating dust. Your horse may develop a cough or start sneezing as a result of breathing in too much dust. Your horse will not be able to perform at 100 percent of his abilities if he is struggling with dust-related problems. Your horse will lose stamina and performance ability if he is struggling with dust-related health problems such as eye irritation, a runny nose, coughing or difficulty breathing. Allergic respiratory disease, which is most commonly known as heaves, can be caused by dusty or moldy hay and bedding. Heaves is a respiratory disease that causes a horse's air-passage linings to thicken and swell. Mucus is produced. As your horse continues to be exposed to the dust and allergens that cause heaves, the disease becomes worse and breathing becomes increasingly difficult. Your horse will struggle to inhale and exhale through the mucus and congested airways. Heaves can be managed after it develops but it can not be cured. Taking measures to reduce the dust in your barn will benefit your horse's health. Feed hay and pellet grains that are low in dust. For horses who have an especially difficult time dealing with dust, soak hay in water before you feed it to them to further reduce dust. Use watering systems to keep dusty barn aisles moist. Avoid doing cleaning that stirs up dust, such as sweeping or raking out barn aisles, while horses are in the building.